These people are building an electronic nose. How does it smell? 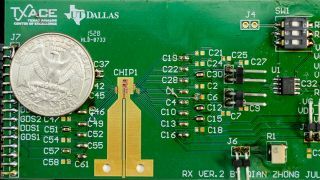 A team of engineers at the University of Texas in Dallas are working to build a cheap, portable electronic nose that could be used in breath analysis to diagnose a wide range of health conditions. Electronic noses aren't new, but the ones that exist today are bulky and expensive. The UT team, lead by Navneet Sharma, believes that the same CMOS integrated circuits that make tablets and mobile phones cheap could do the same job for electronic noses. "We have demonstrated that you can build an affordable electronic nose that can sense many different kinds of smells." said Sharma, the lead author of a paper on the subject. He explained how it works: "When you're smelling something, you are detecting chemical molecules in the air. Similarly, an electronic nose detects chemical compounds using rotational spectroscopy." That's handy in a number of fields, but particularly medicine because a person's breath contains gases from both the stomach and lungs. That means it can deliver information about practically every part of the body. Right now, a prototype is under construction that should be available for beta testing at some point in 2018. Initially the team envision it being used in industrial settings, but as it matures it could migrate to hospitals and doctors' offices, and perhaps even eventually the home. "What we are talking about here is developing a device that imitates another one of our sensing modalities and making it affordable and widely available," said Kenneth O, one of the principal investigators on the project. "Think about how we use smell in our daily lives. The possible use of the electronic nose is almost limitless."